A new documentary film, “The Martyrdom” (poster), portrays the lives of Rev. Kim Yeong-hak, missionary to Russia and first overseas Korean missionary to suffer martyrdom; and Rev. Bae Hyeong-gyu, martyred several years ago in Afghanistan. The film will open on August 13 at Film Forum in Mapo-gu, and at Sponge House in Jongno-gu, Seoul. It was directed by Kim Sang-cheol, whose previous productions include “The Forgotten Bag” (2010), “Addiction” (2013), and “The Follower, Ok Han-heum” (2014). In the film, Director Kim has included never-before-published quotes from the personal record of Rev. Kim’s wife, Ahn Won-jeong. 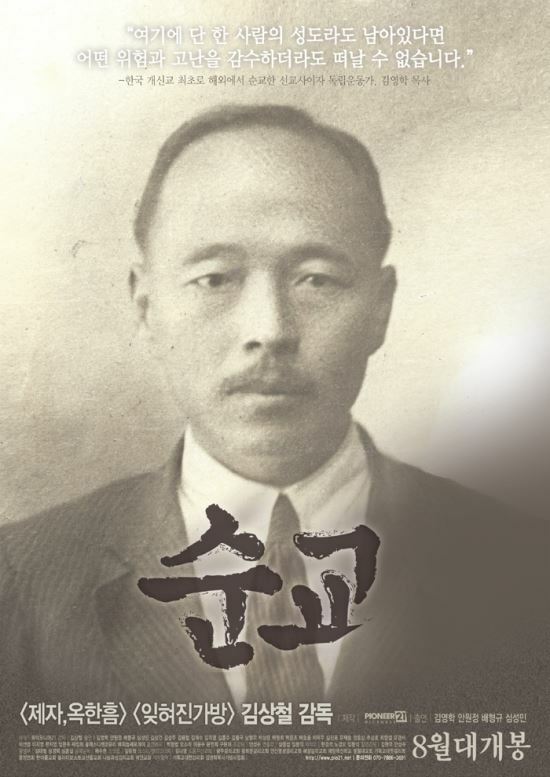 Kim Yeong-hak (1877~1933), born to a yangban (aristocrat) family in Geumcheon, Hwanghae-do, had a chance encounter with an evangelical group, which led to his taking part in a rally. There he heard the gospel message, repented, and became a colporteur, carrying Bibles on his back from place to place and spreading the Word. He was not just a Bible seller, but a communicator of the Gospel. In 1911 Kim took on duties as an evangelist; he graduated from Hyeopseong Seminary, and in 1918 was ordained as a minister. He was head minister of several churches in succession, including Jonggyo Church and Supyogyo Church in Seoul. In 1919, when the March First Independence Movement spread nationwide, he was pastor-in-charge at Yangyang Church in Gangwon-do. He was at the center of the Yangyang Mansei (Long Live Korea) Movement. The great majority of churches in his circuit participated in the March First Movement. Arrested by the Japanese authorities for his movement activities, he underwent three years of hardship in Seoul’s Seodaemun Prison. Released from jail in 1922, he volunteered for mission in Russia. From the early 1920s, the Methodist Church had started mission work in Manchuria and Siberia, mainly through the efforts of Rev. Yang Ju-sam. Many Koreans had moved to these areas to escape persecution under the Japanese empire. Just a few years had passed since the Russian (communist) Revolution (1917). Violent communist believers persecuted the churches, saying, “Religion is the opiate of the people.” Rev. Kim ministered to Koreans in Vladivostok for nine years. In 1930, the Russian Communist Party detained him as a reactionary criminal and tried to force him to reject his faith. He refused; and the following year he was sentenced to 10 years of hard labor and sent to Siberia, where he died before the end of his term. Director Kim filmed on the scene in Russia, following Rev. Kim’s footprints. Director Kim’s attention then turned to Afghanistan. In July 2007, Rev. 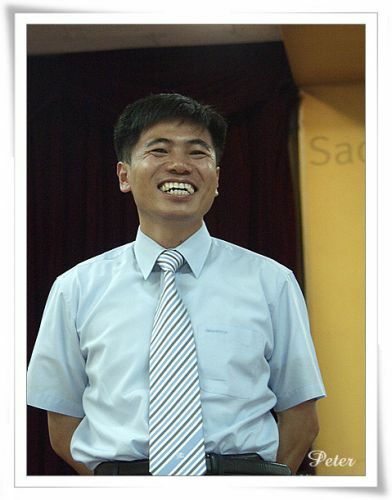 Bae Hyeong-gyu (1965~2007, photo above), in charge of the youth department as assistant pastor of Saemmul Presbyterian Church in Bundang, took on the role of team leader for the Hanminjok Welfare Foundation’s short-term mission team to Afghanistan, leading Saemmul Church’s short-term mission team members. He was kidnapped in Afghanistan’s Ghanzni state by the Taliban, an extremist Muslim group, and was killed by eight gunshots. The General Assembly of the Presbyterian Church of Korea (Tonghap) granted him posthumous status as a missionary, and put him on record as the most recent minister to suffer martyrdom since the Korean War. Appearing in the movie are Rev. Bae’s last photo and the belongings he left behind.